Since young, my mum had always enforced the importance of breakfast to us, my sister and me. Once someone told her that an egg a day would make your children grow up big and smart! (I can testify that the former is wrong, judging from my height, but I hope the latter is right 😉 So, every morning for most of my pre-school, she would make half boil egg for us and a glass of Milo (a popular Malaysian chocolate malt drink). We practically eat the same breakfast everyday for school days until one point I am revolted with the smell of half boiled egg (which suddenly smell really raw) and my mum would insist I finish them. So every morning I would pinch my nose (I learnt from somewhere that we taste through our nose, ha-ha, cheeky me) and down the egg and then quickly wash down with milk or Milo. At one point my sister and I take up a banner and make a riot to sanction a ban on it. Ok, maybe a bit exaggerating but you get the idea. Finally we got our ban and moved on to other breakfasts. But knowing my mum, she would go the fast and easy way, and most of our breakfasts are then bread with jam, or peanut butter and so forth. Soon it got even lazier where my mum would just get chocolate milk drink in cartons. That was a long time ago, and later I came to stay by myself in KL and soon found out how is it to live on my own. Many of my mornings went without breakfast, maybe an occasional cereal and fresh milk, but that’s about it. Most of my university days have me waking up when the sun is already halfway across the sky. Thus breakfast took a back seat in my life. Now, as I grew up more and got into culinary adventures and food craze, I learnt that how important breakfast is (yes mum, I finally understand), and always look forward to have a good breakfast to kick start my day. I even got the penchant back for half boiled egg, especially with toast and a good cup of coffee, kopitiam style. Nowadays, getting into the life of working, I need a good coffee to boost my day. I am now always in search for good and healthy breakfast recipes as I want to go home made style. of course I take into account on time and also ease of eating, as I would sometimes need to have my breakfast in the car. Life is all about rushing isn’t it? Anyway, nowadays I seem to surf a lot on breakfast recipes and was mostly interested in the healthier options such as lower fat, higher nutrients and so forth. I had made quite a number for my everyday breakfasts before I got to work, and so you can be sure of more breakfast recipes to come. To me breakfast is something of a ritual, something exciting to look forward to the night before and the reason for you to get your bum off the bed in the morning. I wouldn’t call it a day without breakfast, won’t you too? I love ginger. It is one of the most useful spice that I ever came about. In Asian cuisines, it mostly used in savouries, especially with meats and in some sweet soups. Since our ancestral times, we know the goodness of ginger, of its medicinal properties, such as aiding in digestion after a heavy meal and also others such as aiding in nausea and other illness. This ginger cake that has crystallized ginger in it is something foreign to us Asians, Malaysians that is, but somehow I am attracted to it, imagining the flavours in my mind. This cake is really light and soft, despite the low fat content and the ginger flavours is just amazing. Sadly though, J did not enjoy it as he felt that it is weird and my housemate Y thought it was chocolate cake at first and got a surprise once she bit into it. She could not exactly guess the taste but once enlighten, she left the cake alone too. Well, I guess I am the only one having ‘foreign’ taste here. 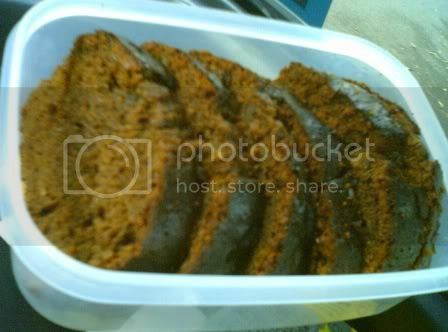 Don’t be put off though, if you’re a ginger lover and you love the thick heavy taste of molasses, this cake is definitely good eats, as it is really tender, moist, gingery and full of flavour from the spices. Preheat oven to 180C. line a 9 by 4 inch loaf pan with baking/parchment paper. Beat the butter and sugar till creamy and fluffy. Stir in molasses and crystallized ginger. In another bowl, sift together flour, baking soda and the spices. Stir the flour mixture into the butter mixture in 3 additions, alternating with yoghurt, starting and ending with flour. Pour into prepared pan and bake in oven for 45-50 minutes. Transfer to wire rack and let it cool for 10 minutes or so. Then turn the loaf out onto the rack. It tastes divine warm out of the oven, still good in room temperature but it would turn hard once refrigerated. It keeps well for about 5 days in air-tight container and room temperature; if it is still around. Now have a few slices and call it a day! P/S: This post is added into Nandita’s Weekend Breakfast Blogging over at Saffron Trail. Do look out for the forthnightly roundup! Update: The roundup is here, Part 1 and Part 2. More food to wake up to!